Three types of applications are available: for the desktop (Windows, macOS and Linux), for mobile (Android and iOS) and for terminal (Windows, macOS and Linux). All applications have similar user interfaces and can synchronise with each other. The portable application allows installing the software on a portable device such as a USB key. Simply copy the file JoplinPortable.exe in any directory on that USB key ; the application will then create a directory called "JoplinProfile" next to the executable file. Linux or Windows (via WSL) Important: First, install Node 8+. Node 8 is LTS but not yet available everywhere so you might need to manually install it. By default, the application binary will be installed under ~/.joplin-bin. You may change this directory if needed. Alternatively, if your npm permissions are setup as described here (Option 2) then simply running npm -g install joplin would work. Arch Linux An Arch Linux package is available here. To install it, use an AUR wrapper such as yay: yay -S joplin. Both the CLI tool (type joplin) and desktop app (type joplin-desktop) are packaged. For support, please go to the GitHub repo. To start it, type joplin. For usage information, please refer to the full Joplin Terminal Application Documentation. The Web Clipper is a browser extension that allows you to save web pages and screenshots from your browser. For more information on how to install and use it, see the Web Clipper Help Page. Desktop, mobile and terminal applications. Web Clipper for Firefox and Chrome. Synchronisation with various services, including NextCloud, Dropbox, WebDAV and OneDrive. Import Enex files (Evernote export format) and Markdown files. Export JEX files (Joplin Export format) and raw files. Support notes, to-dos, tags and notebooks. Sort notes by multiple criteria - title, updated time, etc. Support for alarms (notifications) in mobile and desktop applications. Offline first, so the entire data is always available on the device even without an internet connection. 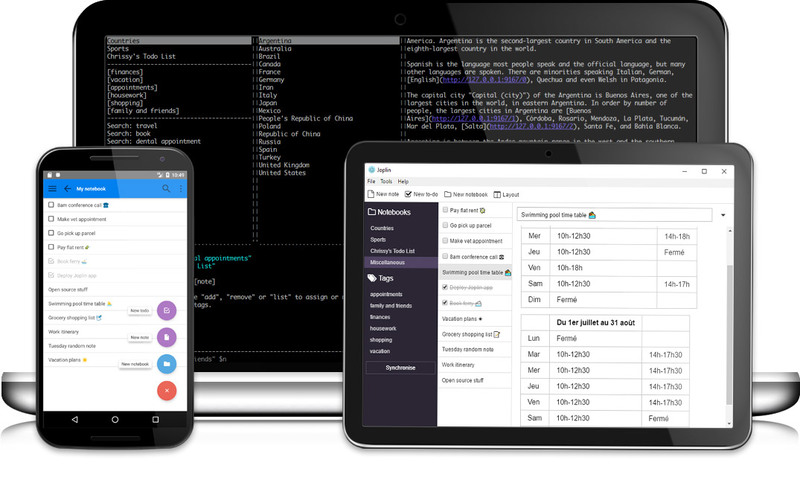 Markdown notes, which are rendered with images and formatting in the desktop and mobile applications. 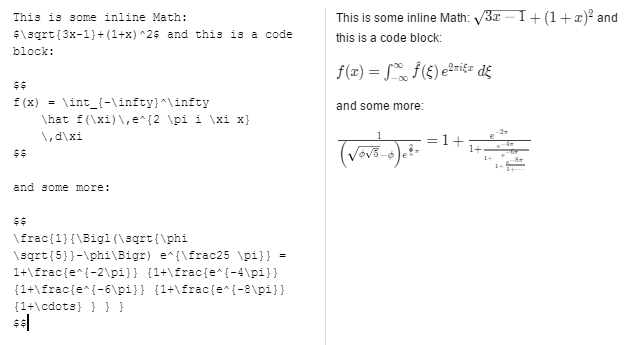 Support for extra features such as math notation and checkboxes. File attachment support - images are displayed, and other files are linked and can be opened in the relevant application. External editor support - open notes in your favorite external editor with one click in Joplin. Recognition data - Evernote images, in particular scanned (or photographed) documents have recognition data associated with them. It is the text that Evernote has been able to recognise in the document. This data is not preserved when the note are imported into Joplin. However, should it become supported in the search tool or other parts of Joplin, it should be possible to regenerate this recognition data since the actual image would still be available. Colour, font sizes and faces - Evernote text is stored as HTML and this is converted to Markdown during the import process. For notes that are mostly plain text or with basic formatting (bold, italic, bullet points, links, etc.) this is a lossless conversion, and the note, once rendered back to HTML should be very similar. Tables are also imported and converted to Markdown tables. For very complex notes, some formatting data might be lost - in particular colours, font sizes and font faces will not be imported. The text itself however is always imported in full regardless of formatting. On the desktop application, open File > Import > ENEX and select your file. The notes will be imported into a new separate notebook. If needed they can then be moved to a different notebook, or the notebook can be renamed, etc. On the terminal application, in command-line mode, type import /path/to/file.enex. This will import the notes into a new notebook named after the filename. Joplin can import notes from plain Markdown file. You can either import a complete directory of Markdown files or individual files. On the desktop application, open File > Import > MD and select your Markdown file or directory. On the terminal application, in command-line mode, type import --format md /path/to/file.md or import --format md /path/to/directory/. Tomboy Notes: Export the notes to ENEX files as described here for example, and import these ENEX files into Joplin. OneNote: First import the notes from OneNote into Evernote. Then export the ENEX file from Evernote and import it into Joplin. NixNote: Synchronise with Evernote, then export the ENEX files and import them into Joplin. More info in this thread. Joplin can export to the JEX format (Joplin Export file), which is a tar file that can contain multiple notes, notebooks, etc. This is a lossless format in that all the notes, but also metadata such as geo-location, updated time, tags, etc. are preserved. This format is convenient for backup purposes and can be re-imported into Joplin. A "raw" format is also available. This is the same as the JEX format except that the data is saved to a directory and each item represented by a single file. One of the goals of Joplin was to avoid being tied to any particular company or service, whether it is Evernote, Google or Microsoft. As such the synchronisation is designed without any hard dependency to any particular service. Most of the synchronisation process is done at an abstract level and access to external services, such as Nextcloud or Dropbox, is done via lightweight drivers. It is easy to support new services by creating simple drivers that provide a filesystem-like interface, i.e. the ability to read, write, delete and list items. It is also simple to switch from one service to another or to even sync to multiple services at once. Each note, notebook, tags, as well as the relation between items is transmitted as plain text files during synchronisation, which means the data can also be moved to a different application, can be easily backed up, inspected, etc. Currently, synchronisation is possible with Nextcloud, Dropbox (by default), OneDrive or the local filesystem. To setup synchronisation please follow the instructions below. After that, the application will synchronise in the background whenever it is running, or you can click on "Synchronise" to start a synchronisation manually. Nextcloud is a self-hosted, private cloud solution. It can store documents, images and videos but also calendars, passwords and countless other things and can sync them to your laptop or phone. As you can host your own Nextcloud server, you own both the data on your device and infrastructure used for synchronisation. As such it is a good fit for Joplin. The platform is also well supported and with a strong community, so it is likely to be around for a while - since it's open source anyway, it is not a service that can be closed, it can exist on a server for as long as one chooses. On the desktop application or mobile application, go to the config screen and select Nextcloud as the synchronisation target. Then input the WebDAV URL (to get it, click on Settings in the bottom left corner of the page, in Nextcloud), this is normally https://example.com/nextcloud/remote.php/webdav/Joplin (make sure to create the "Joplin" directory in Nextcloud), and set the username and password. If it does not work, please see this explanation for more details. If synchronisation does not work, please consult the logs in the app profile directory - it is often due to a misconfigured URL or password. The log should indicate what the exact issue is. When syncing with Dropbox, Joplin creates a sub-directory in Dropbox, in /Apps/Joplin and read/write the notes and notebooks from it. The application does not have access to anything outside this directory. On the desktop application or mobile application, select "Dropbox" as the synchronisation target in the config screen (it is selected by default). Then, to initiate the synchronisation process, click on the "Synchronise" button in the sidebar and follow the instructions. Select the "WebDAV" synchronisation target and follow the same instructions as for Nextcloud above. WebDAV Nav, a macOS server. When syncing with OneDrive, Joplin creates a sub-directory in OneDrive, in /Apps/Joplin and read/write the notes and notebooks from it. The application does not have access to anything outside this directory. On the desktop application or mobile application, select "OneDrive" as the synchronisation target in the config screen. Then, to initiate the synchronisation process, click on the "Synchronise" button in the sidebar and follow the instructions. On the terminal application, to initiate the synchronisation process, type :sync. You will be asked to follow a link to authorise the application (simply input your Microsoft credentials - you do not need to register with OneDrive). Joplin supports end-to-end encryption (E2EE) on all the applications. E2EE is a system where only the owner of the notes, notebooks, tags or resources can read them. It prevents potential eavesdroppers - including telecom providers, internet providers, and even the developers of Joplin from being able to access the data. Please see the End-To-End Encryption Tutorial for more information about this feature and how to enable it. For a more technical description, mostly relevant for development or to review the method being used, please see the Encryption specification. Joplin notes can be opened and edited using an external editor of your choice. It can be a simple text editor like Notepad++ or Sublime Text or an actual Markdown editor like Typora. In that case, images will also be displayed within the editor. To open the note in an external editor, click on the icon in the toolbar or press Ctrl+E (or Cmd+E). Your default text editor will be used to open the note. If needed, you can also specify the editor directly in the General Options, under "Text editor command". Any kind of file can be attached to a note. In Markdown, links to these files are represented as a simple ID to the resource. In the note viewer, these files, if they are images, will be displayed or, if they are other files (PDF, text files, etc.) they will be displayed as links. Clicking on this link will open the file in the default application. On the desktop application, images can be attached either by clicking on "Attach file" or by pasting (with Ctrl+V) an image directly in the editor, or by drag and dropping an image. Resources that are not attached to any note will be automatically deleted after 10 days (see rationale). Important: Resources larger than 10 MB are not currently supported on mobile. They will crash the application when synchronising so it is recommended not to attach such resources at the moment. The issue is being looked at. Windows: >= 8. Make sure the Action Center is enabled on Windows. Task bar balloon for Windows < 8. Growl as fallback. Growl takes precedence over Windows balloons. macOS: >= 10.8 or Growl if earlier. On mobile, the alarms will be displayed using the built-in notification system. If for any reason the notifications do not work, please open an issue. Sub-notebooks allow organising multiple notebooks into a tree of notebooks. For example it can be used to regroup all the notebooks related to work, to family or to a particular project under a parent notebook. On the desktop application, to create a subnotebook, drag and drop it onto another notebook. To move it back to the root, drag and drop it on the "Notebooks" header. Currently only the desktop app can be used to organise the notebooks. 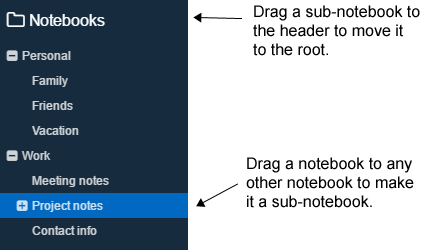 The mobile application supports displaying and collapsing/expanding the tree of notebooks, however it does not currently support moving the subnotebooks to different notebooks. The terminal app supports displaying the tree of subnotebooks but it does not support collapsing/expanding them or moving the subnotebooks around. Since getting the ID of a note is not straightforward, each app provides a way to create such link. In the desktop app, right click on a note an select "Copy Markdown link". In the mobile app, open a note and, in the top right menu, select "Copy Markdown link". You can then paste this link anywhere in another note. Joplin supports a number of plugins that can be toggled on top the standard markdown features you would expect. These toggle-able plugins are listed below. Note: not all of the plugins are enabled by default, if the enable field is 'no' below, then enter Tools->General Options to enable the plugin. Plugins can be disabled in the same manner. The checkboxes can then be ticked in the mobile and desktop applications. Rendered markdown can be customized by placing a userstyle file in the profile directory ~/.config/joplin-desktop/userstyle.css (This path might be different on your device - check at the top of the Config screen for the exact path). This file supports standard CSS syntax. Note that this file is used only when display the notes, not when printing or exporting to PDF. This is because printing has a lot more restrictions (for example, printing white text over a black background is usually not wanted), so special rules are applied to make it look good when printing, and a userstyle.css would interfer with that. Multiples words Returns all the notes that contain all these words, but not necessarily next to each other. dog cat - will return any notes that contain the words "dog" and "cat" anywhere in the note, no necessarily in that order nor next to each others. It will not return results that contain "dog" or "cat" only. Phrase query Add double quotes to return the notes that contain exactly this phrase. "shopping list" - will return the notes that contain these exact terms next to each others and in this order. It will not return for example a note that contain "going shopping with my list". Notes are sorted by "relevance". Currently it means the notes that contain the requested terms the most times are on top. For queries with multiple terms, it also matter how close to each others are the terms. This is a bit experimental so if you notice a search query that returns unexpected results, please report it in the forum, providing as much details as possible to replicate the issue. Donations to Joplin support the development of the project. Developing quality applications mostly takes time, but there are also some expenses, such as digital certificates to sign the applications, app store fees, hosting, etc. Most of all, your donation will make it possible to keep up the current development standard. Please see the donation page for information on how to support the development of Joplin. For general discussion about Joplin, user support, software development questions, and to discuss new features, go to the Joplin Forum. It is possible to login with your GitHub account. Also see here for information about the latest releases and general news. For bug reports and feature requests, go to the GitHub Issue Tracker. The latest news are posted on the Patreon page. Download Poedit, the translation editor, and install it. Download the file to be translated. In Poedit, open this .pot file, go into the Catalog menu and click Configuration. Change "Country" and "Language" to your own country and language. From then you can translate the file. Once it is done, please either open a pull request or send the file to this address. This translation will apply to the three applications - desktop, mobile and terminal. To update a translation, follow the same steps as above but instead of getting the .pot file, get the .po file for your language from the table below. Resources larger than 10 MB are not currently supported on mobile. They will crash the application so it is recommended not to attach such resources at the moment. The issue is being looked at.